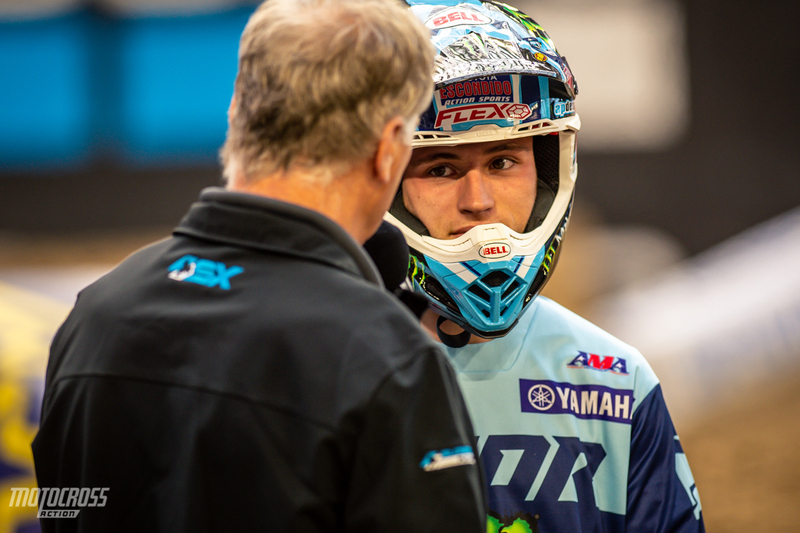 Cooper Webb has a new found confidence and everyone can see it. 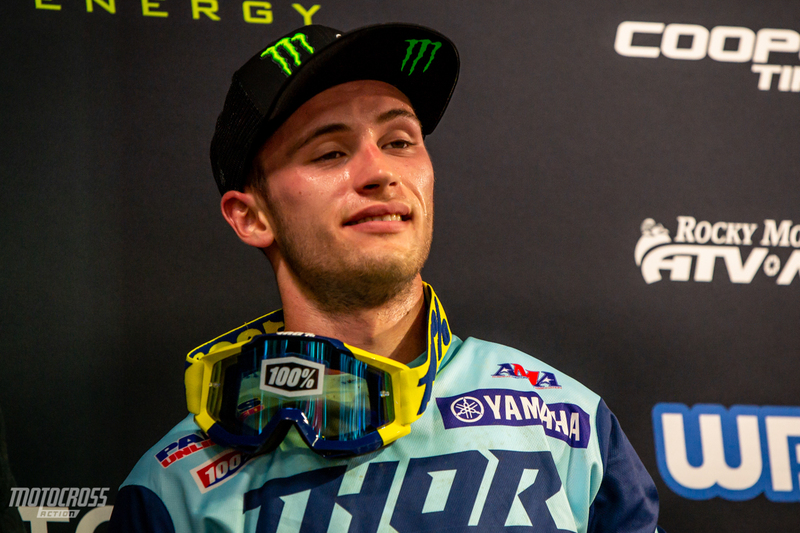 With three wins he is the only 450 rider to win multiple times in 2019. 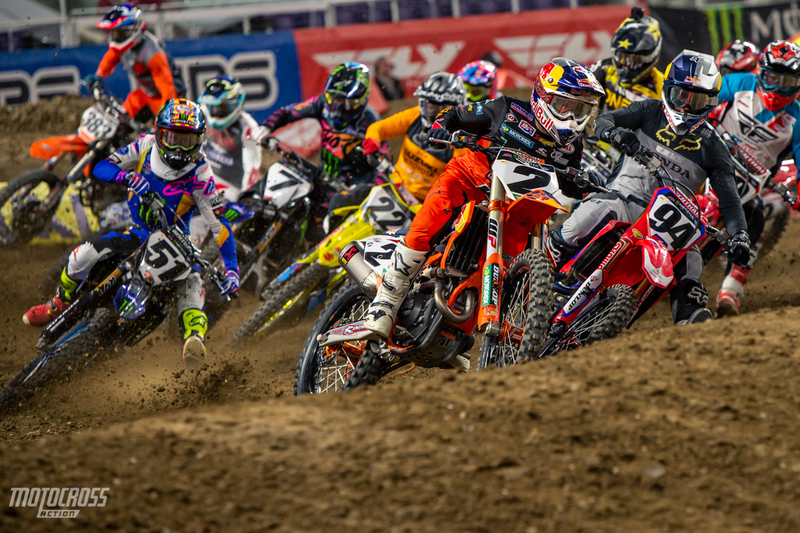 The 2019 Monster Energy Supercross season has been nothing short of exciting. The sixth round of the series happened inside of the Minnesota Viking’s U.S. Bank stadium. It was hard to breathe outside due to the sub-zero weather and it was also hard to breathe inside and not from the temperature, but because of the intense racing! 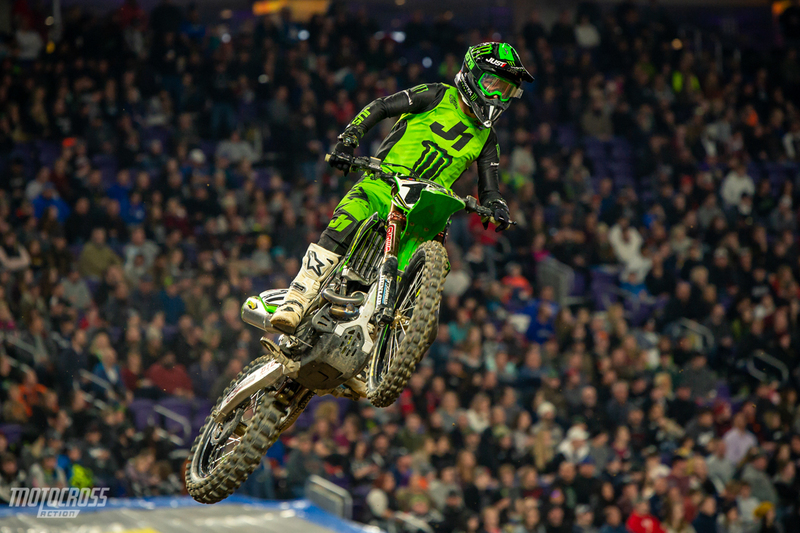 The Minnesota fans braved the harsh weather to get to the race and luckily for them, the riders delivered an awesome show. Our attention was completely locked in for both of the Main events in Minneapolis. Cooper Webb grabbed the holeshot in the 450 main, but it was Joey Savatgy who swept around the outside and made the pass on Webb in the first rhythm section to take the lead. 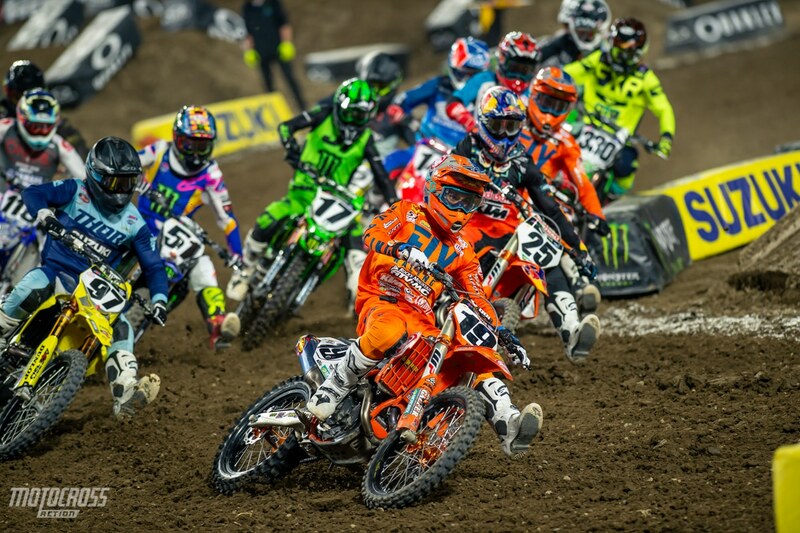 Joey led for fourteen laps with Cooper Webb, Ken Roczen, Blake Baggett and Marvin Musquin following like a freight train behind him. 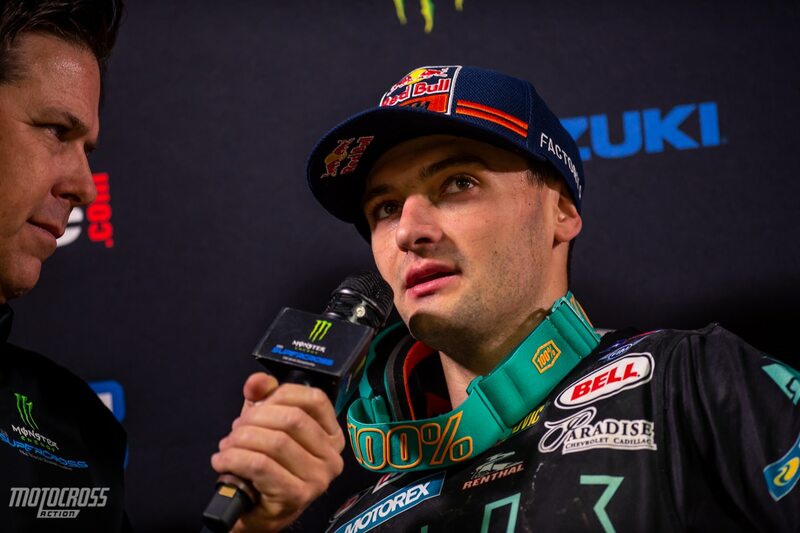 In the 450 class we’ve had four different winners in six rounds, and the only rider to win more than once is Cooper Webb who has now won three times! 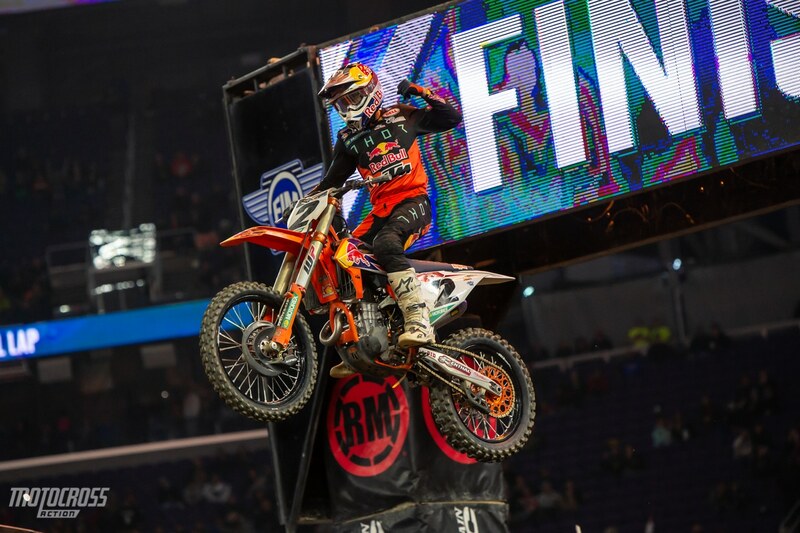 Surprisingly, Ken Roczen and Marvin Musquin are still trying to get their first Main event wins of the year and although they haven’t been winners in 2019, they are still at the front in the 450 Championship point standings. 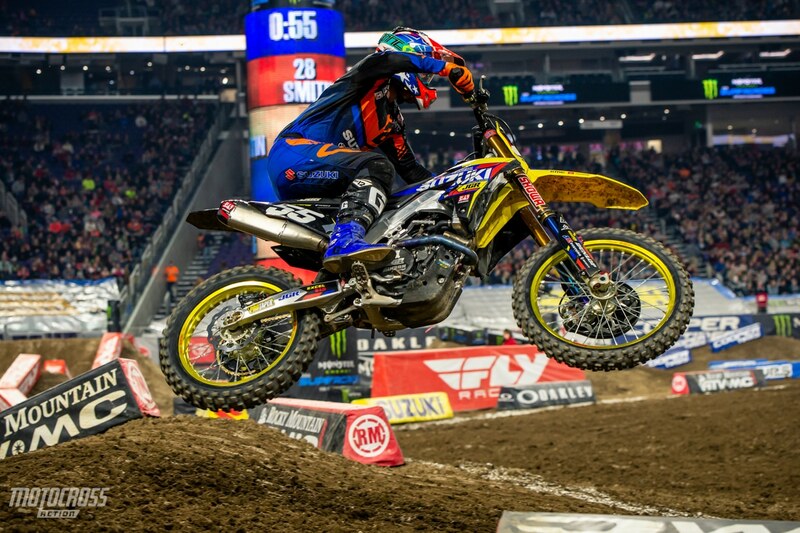 After his second place in Minneapolis, Ken Roczen has gained the points lead again by just one point over Cooper Webb. 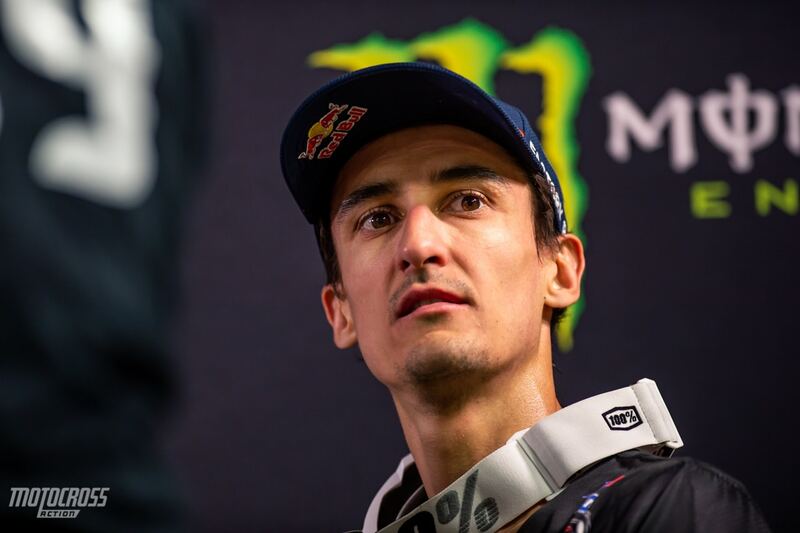 Eli Tomac and Marvin Musquin are both tied for third in the Championship, just two points behind Roczen going into round seven which will be held in Arlington, Texas. 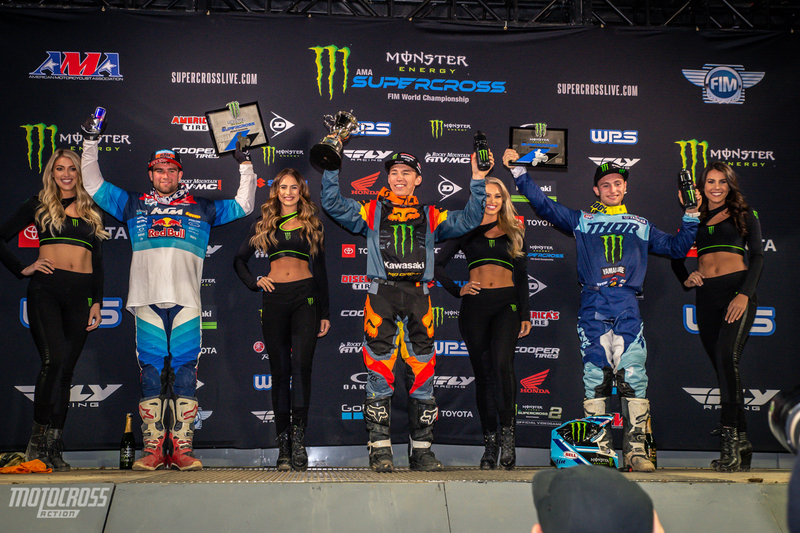 Austin Forkner, Jordon Smith and Justin Cooper land on the podium at the first round of the 250 East series. 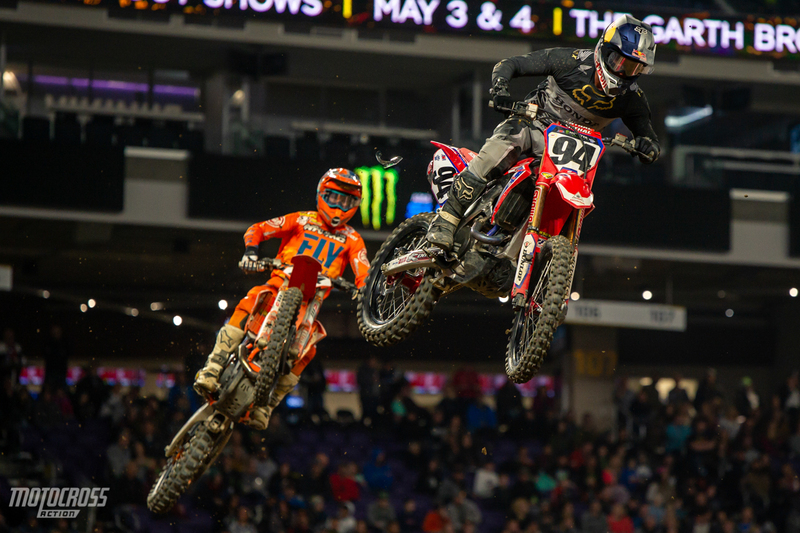 Minneapolis was round number one for the 250 East division and after watching the 250 West riders for the last five Saturdays, they were antsy to drop the gate. All night the 250 class was crazy to watch. 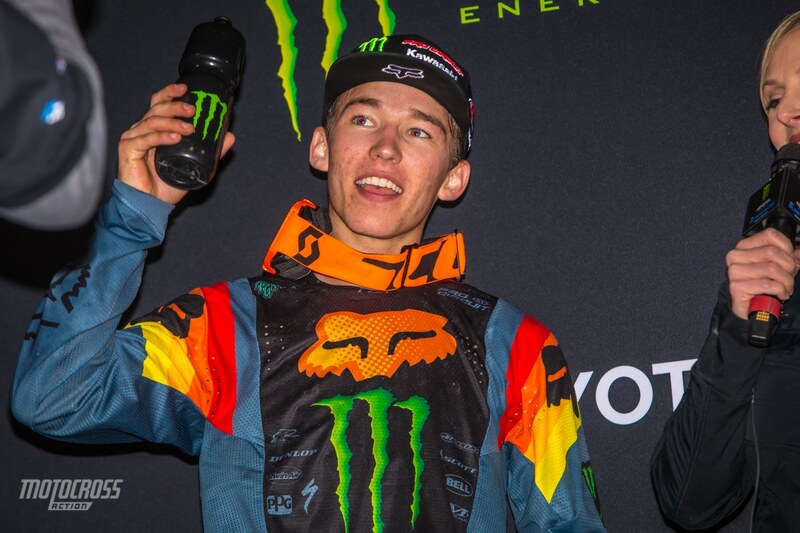 Austin Forkner was the only 250 rider to ride a mistake free night, he got the holeshot and won both his heat race and Main event. 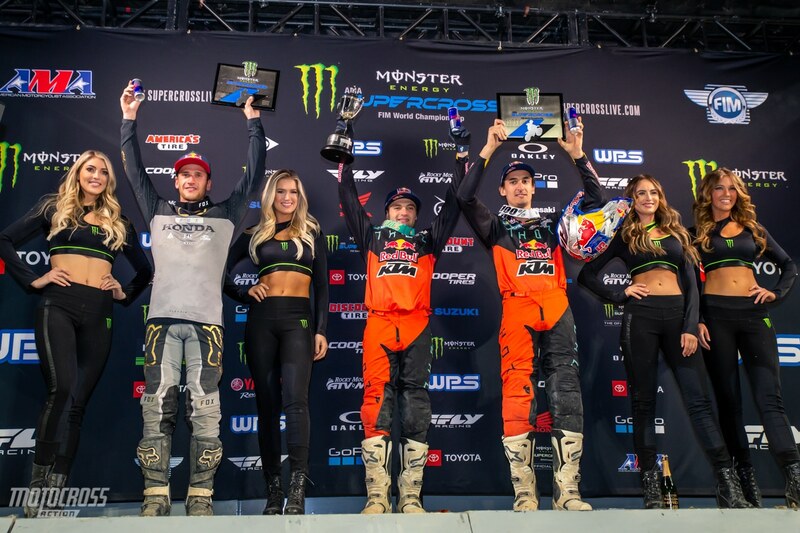 Jordon Smith overcame some adversity to finish second and the rookie Justin Cooper made an aggressive pass on Alex Martin with one lap to go to land himself on the podium in his second Supercross race ever. 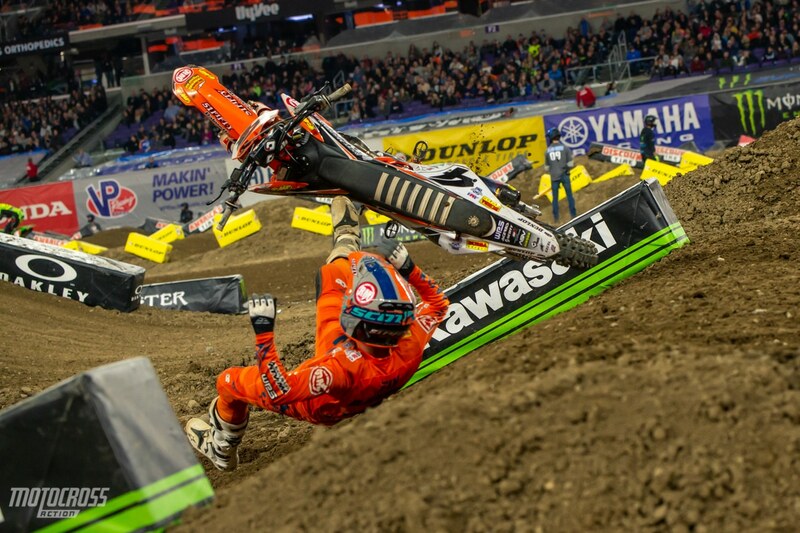 We are happy to say that Blake Baggett got up quickly and walked away from this one. Scroll down to see a photo of his bike. The track in Minneapolis was pretty simple compared to the other tracks we’ve seen so far this season, most of the riders were doing the same rhythms through the three different rhythm lanes and there was only one whoop section. The whoops developed a rut through the middle of them and a lot of the riders were jumping through them. The track broke down quite a bit throughout the day but the Dirt Wurx crew made sure to keep prepping it as often as they could. 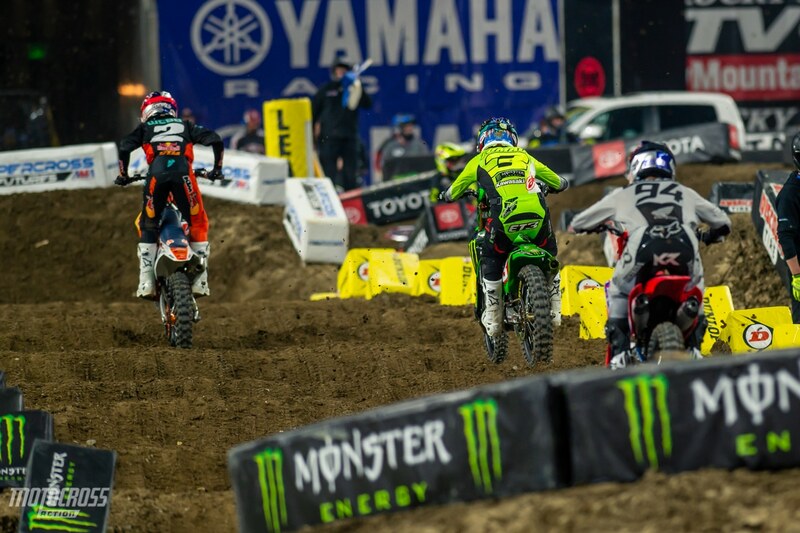 It was the first time in a long time that lime wasn’t in the dirt due to the San Diego Supercross lime controversy. 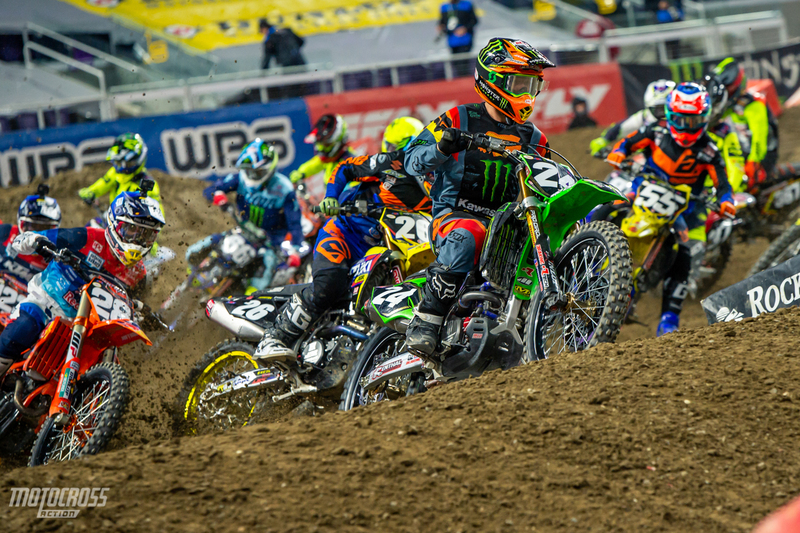 Feld has banned lime from Supercross tracks moving forward, but are working on alternatives. Without lime the tracks won’t hold up as well and will develop big ruts. 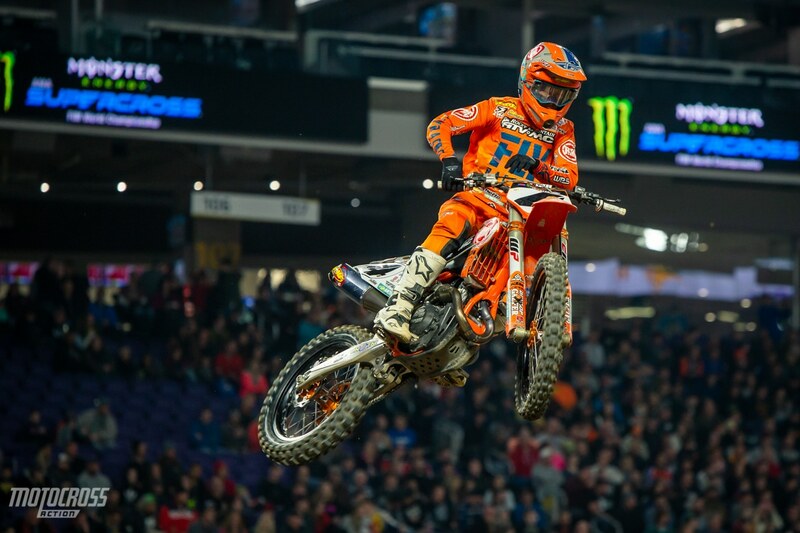 There were only 38 riders in the 450 class and 44 riders in the 250 class that showed up to the cold Minneapolis Supercross. Because of the low amount of riders, we only had two 450 qualifying groups and two 250 groups. This meant there were less practice groups, less riders on the track and more time to groom the rutted sections. 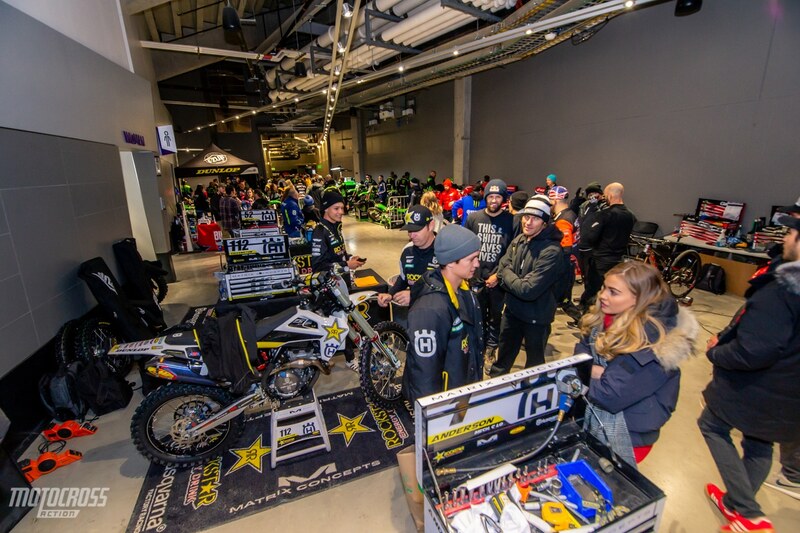 The weather in Minnesota made it difficult for riders and teams to travel to round six and the negative temperatures eliminated the chances of having a pit party. Luckily the U.S. Bank stadium is indoors and there was enough room on the bottom level of the stadium for all of the riders and teams to pit inside. Unfortunately, fans were not allowed to go into the pits, only those with Supercross credentials. 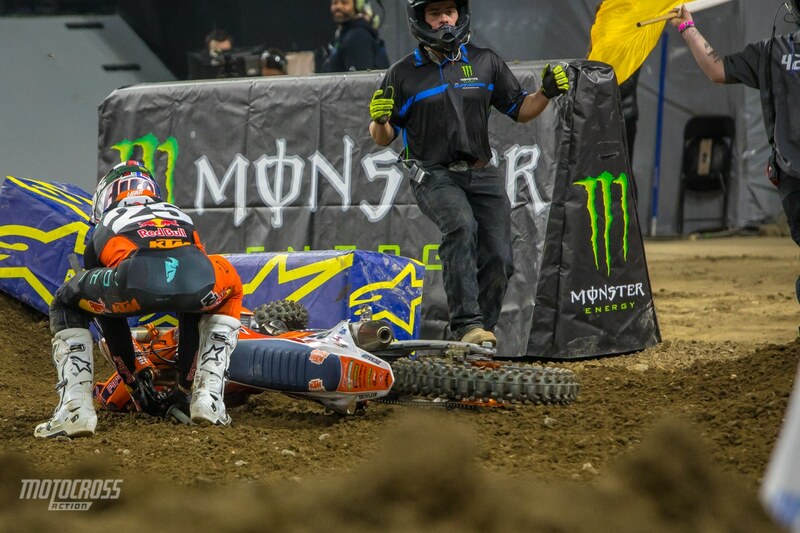 Part two of Blake Baggett’s crash. 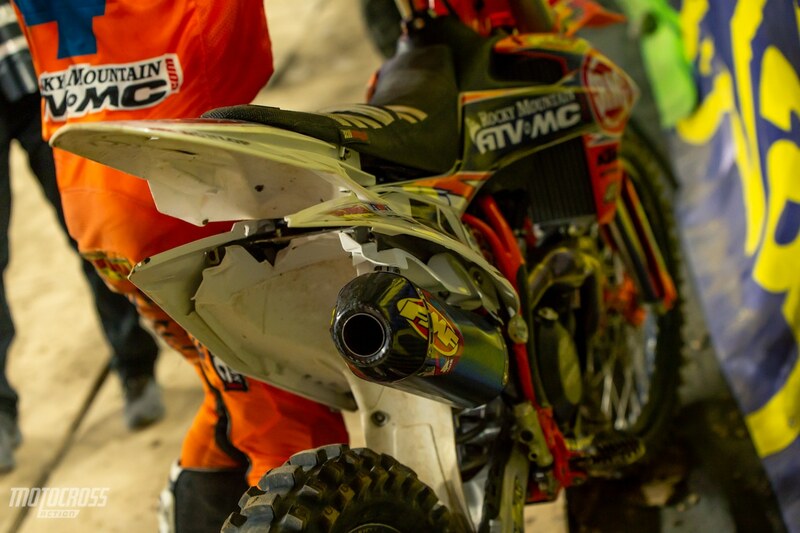 Blake Baggett’s bike after the fact. Cooper Webb fist pumps after his third 450 Main event win of his career. 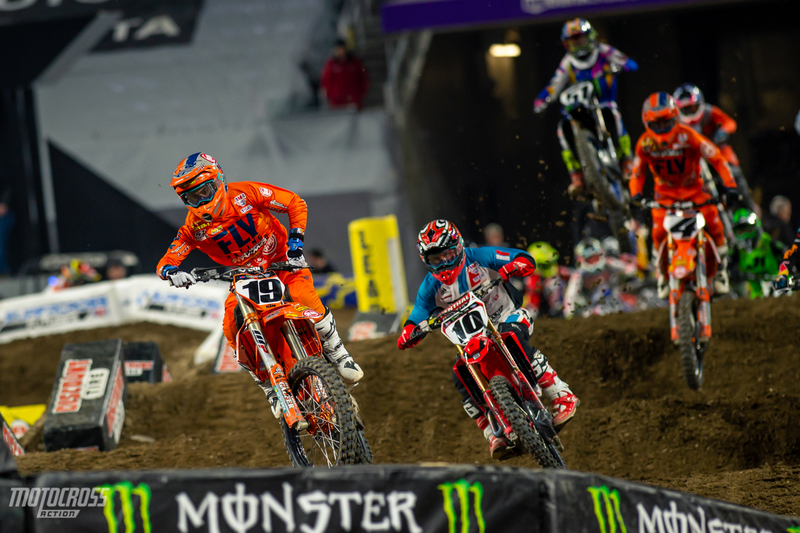 Joey Savagty led the 450 Main event for fourteen laps before Cooper Webb made the pass. 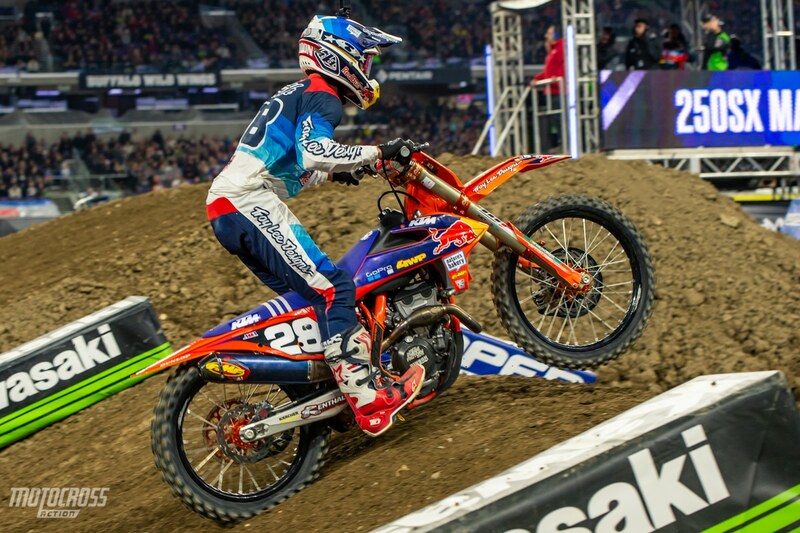 Then Savagty ran second until lap twenty when Ken Roczen, Marvin Musquin and Blake Baggett all passed him. Blake then went down shortly after and Joey finished fourth. This is how close the racing was for most of the Main event with Savatgy leading, Webb second, Roczen third and Baggett fourth. It was hard for anyone to try and make a pass because if they got out of the main line they could be leaving the door open to possibly get passed by the next rider behind them. 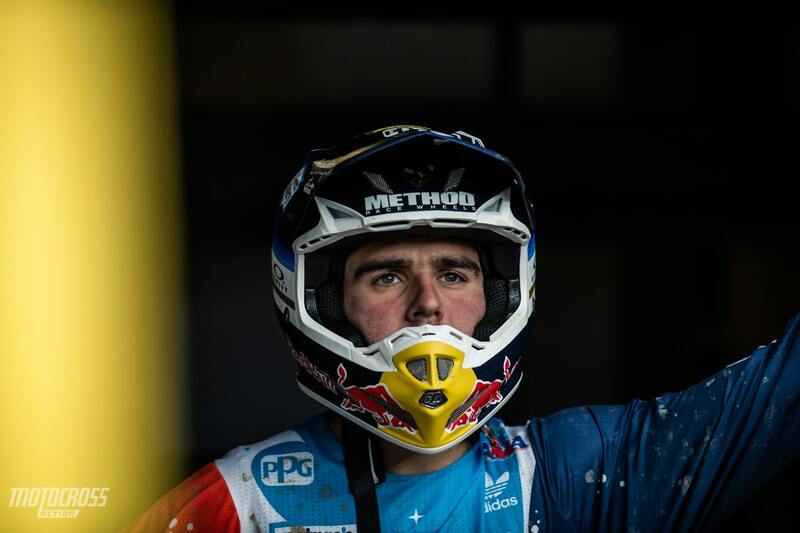 The race was intense and Cooper Webb used a good strategy to win. Marvin had a rough heat race. He crashed in the same corner twice and made a huge mistake in one of the rhythm sections where he almost went down again. He turned his night around in the Main event though. A mid pack start had Musquin in eighth on the first lap. He fought all the way up to finish third and he’s now only two points behind Ken Roczen for the points lead. 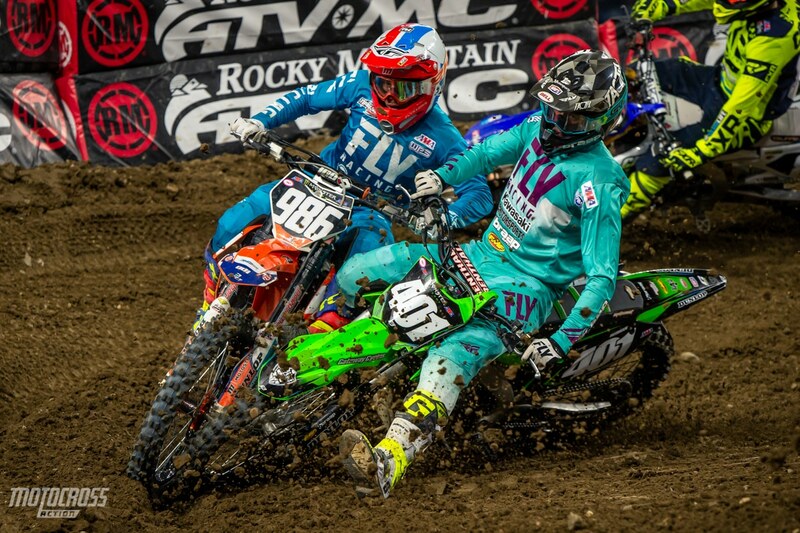 Blake Baggett was on the move in Minneapolis. 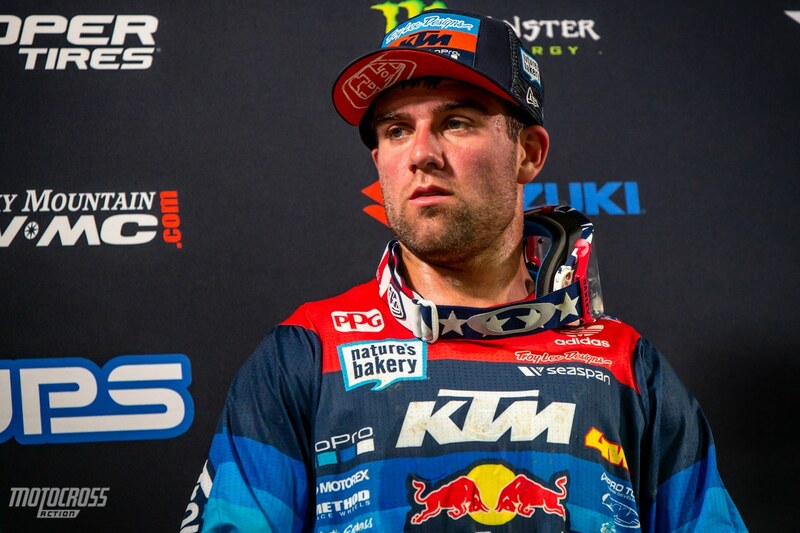 He pressured Ken Roczen for the entire race up until his crash. He went down with four laps to go and we can’t help but wonder if he would’ve been able to get around Ken or not if he didn’t go down. 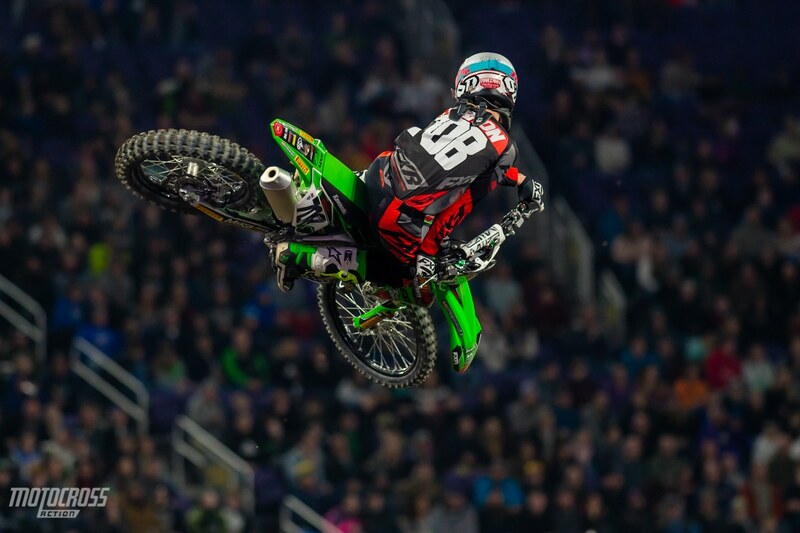 Either way, Blake Baggett has stepped it up in 2019. 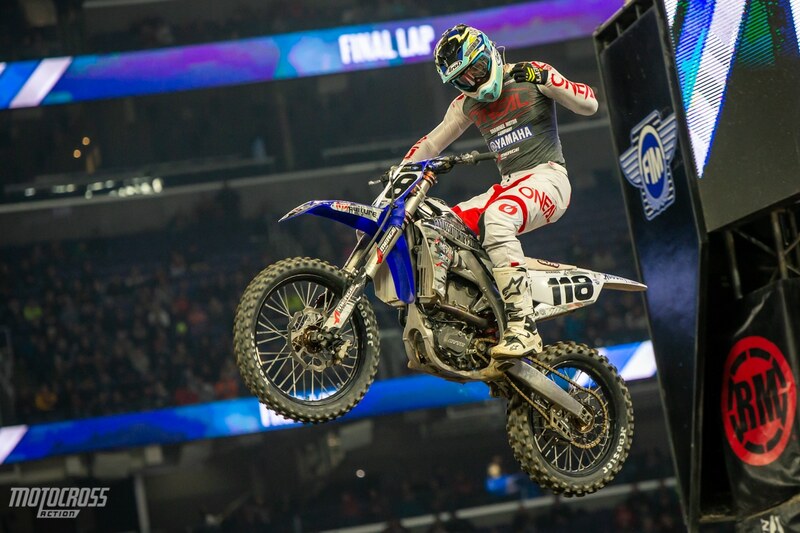 Justin Brayton grew up in Iowa, just south of Minnesota. He had a lot of fans at the race and we think that they gave Brayton an extra boost. He won his heat race and finished fifth in the Main event. Eli Tomac had a rough go in the Main. He crossed the line sixteenth on the first lap and he worked for twenty-eight laps to pass up to sixth. 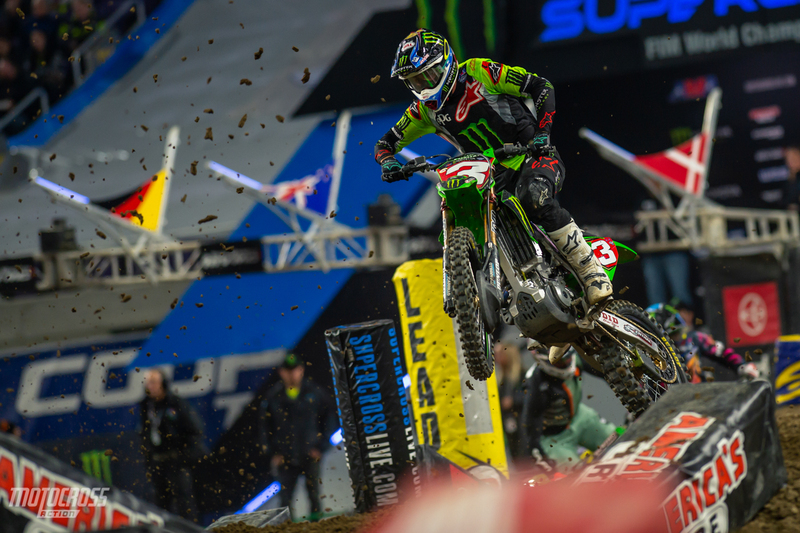 We expected Eli to move through the pack faster and farther, but the track in Minneapolis made it hard for riders to make passes on Saturday. Chad Reed made this pass on Dean Wilson with three laps left to earn seventh place. 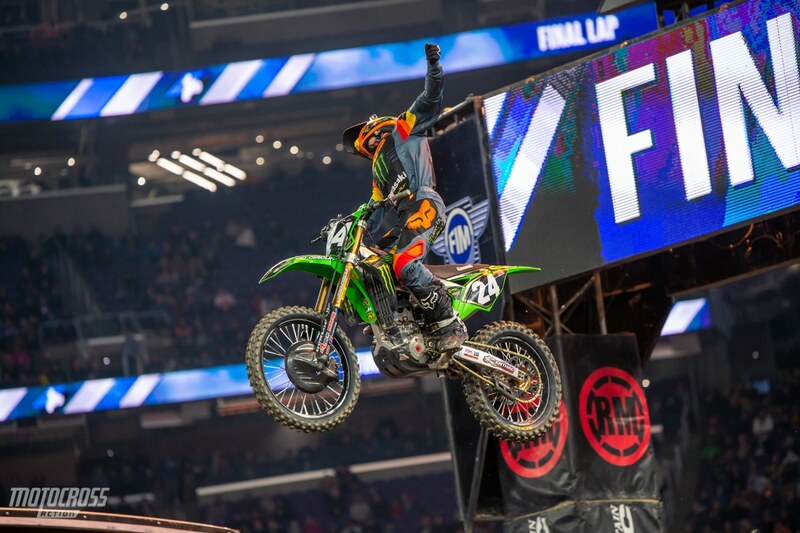 Austin Forkner claimed the first win of the 2019 250 East Supercross series and the third Supercross win of his young career. Forkner had his fair share of crashes in qualifying, but he bounced back from each wreck and qualified on top. 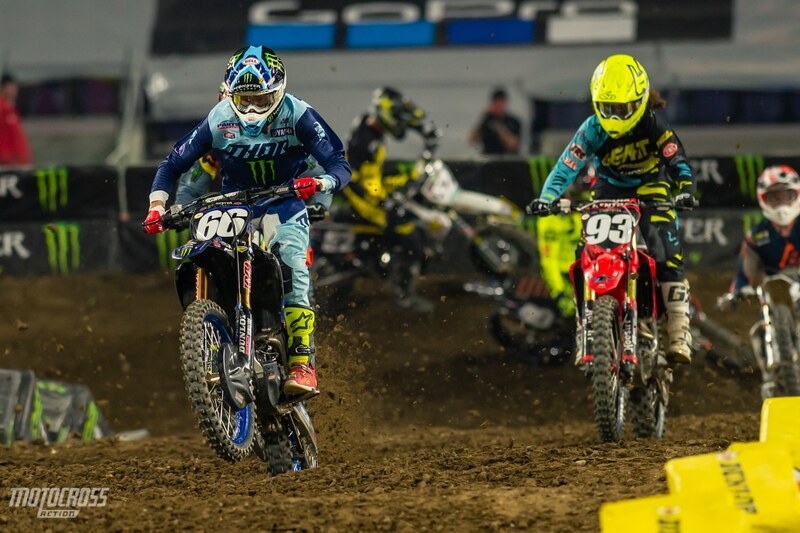 Then he rode flawless in the night show to holeshot and win both the heat race and Main event. 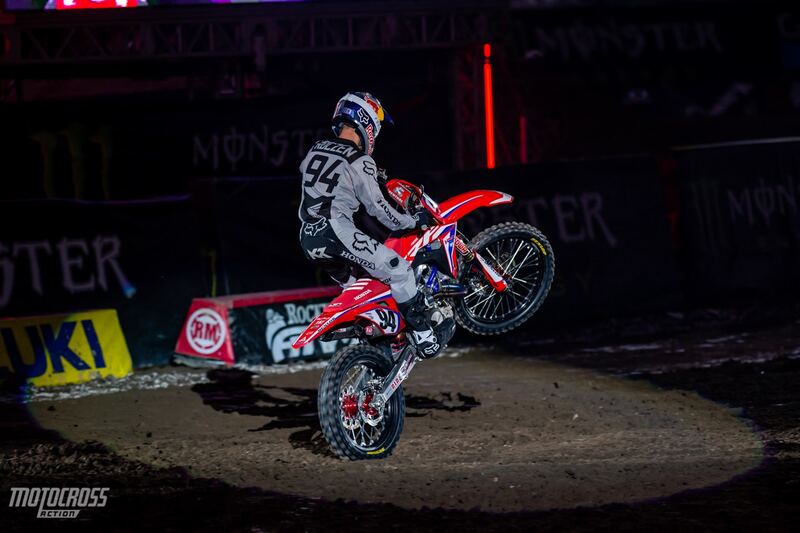 Jordon Smith went through a lot to land himself on the podium in Minneapolis. First his mechanic had to change his wheel just moments before the 30-second board went sideways. Jordon ran fifth at the beginning of the race, he passed his way up to second and was slowly catching Forkner before he went down and dropped back to fifth. Jordon got up and again, he passed his way through to finish second. 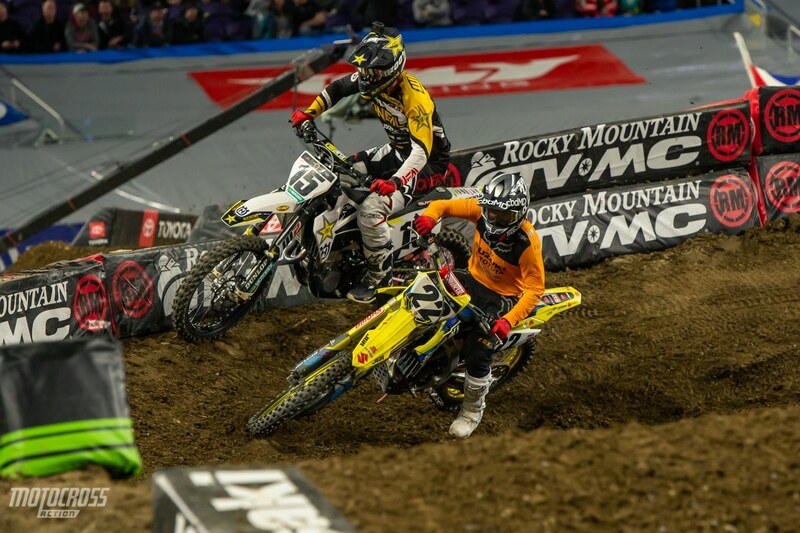 Minneapolis was Justin Cooper’s second Supercross race ever, but he didn’t ride like a rookie. 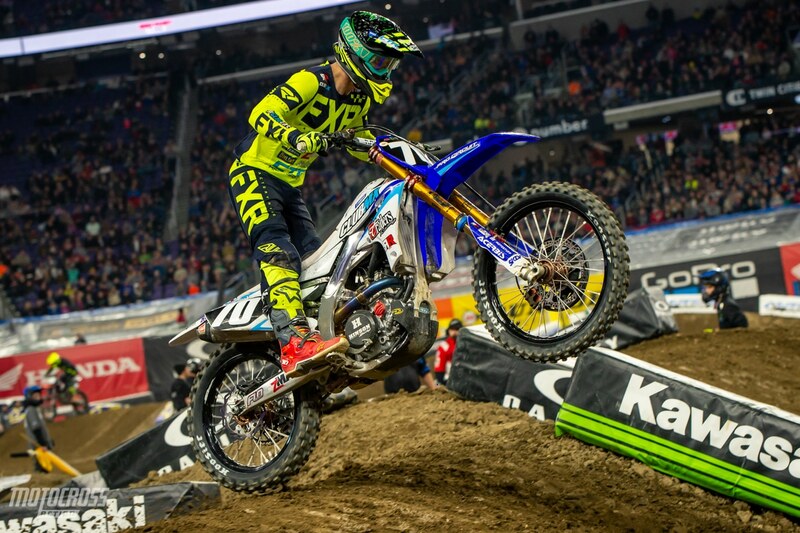 The young Yamaha rider ran in fourth for most of the Main event before making an aggressive pass and slamming into Alex Martin right before the white flag. 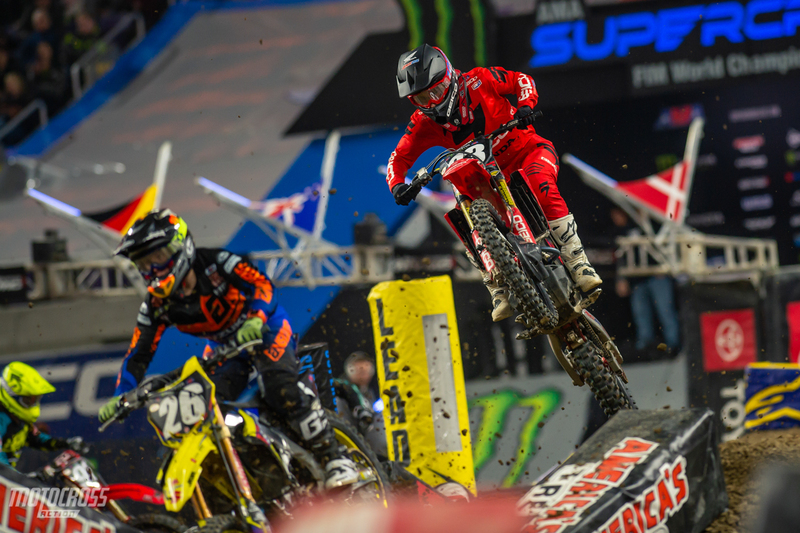 Alex Martin was hit off the track and had to go around the finish line jump while Justin Cooper inherited third place. 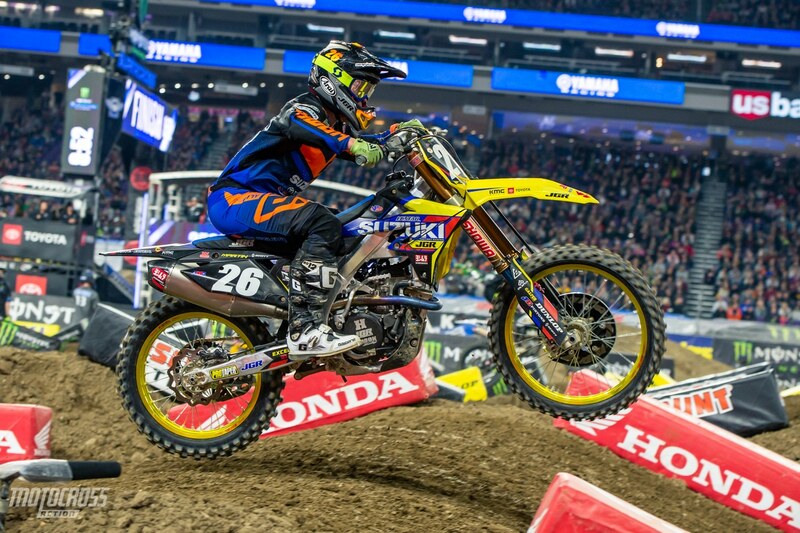 Alex Martin looked great all night on his new JGR Suzuki ride. Martin ran third for most of the Main event until Justin Cooper hit him off of the track with one lap to go. Alex had to go around the finish line which meant that his transponder didn’t register that lap. The original results sheet scored Alex thirteenth, but after the AMA reviewed it, they corrected it and which gave Alex fourth place. Chase Sexton was running in fourth when Alex Martin missed a triple in a rhythm section. Alex doubled it while Chase tripled and almost landed on Alex. When Chase landed he slammed on the brakes to avoid a collision and this caused him to go down. He picked his bike up in fifth and finished his Main event there. 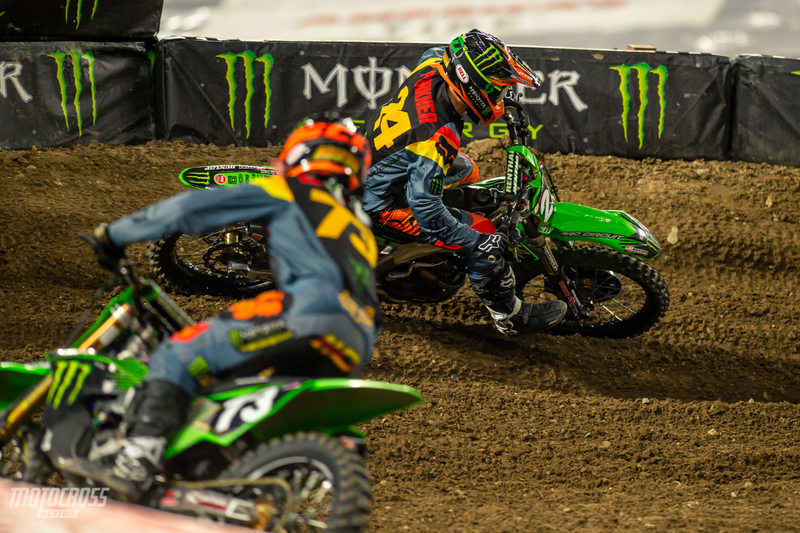 Martin Davalos #73 was this close to Austin Forkner at the very beginning of the 250 Main event, but on lap four Jordon Smith passed Martin and then immediately after, Alex Martin took him out. Davalos got up in eighth but he had more troubles and fell back to finish sixteenth. 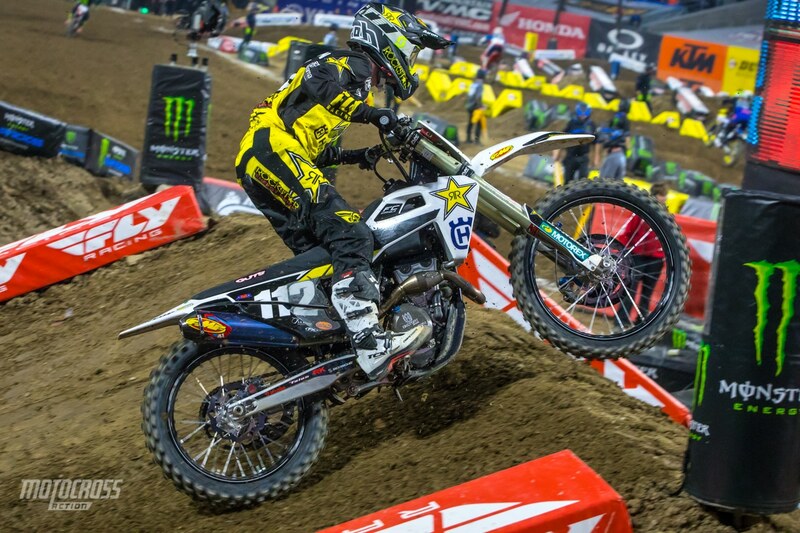 The Rockstar Husqvarna rookie, Jordan Bailey finished ninth in Minneapolis. Kyle Peters rode well all day to finish tenth on his JGR Suzuki. 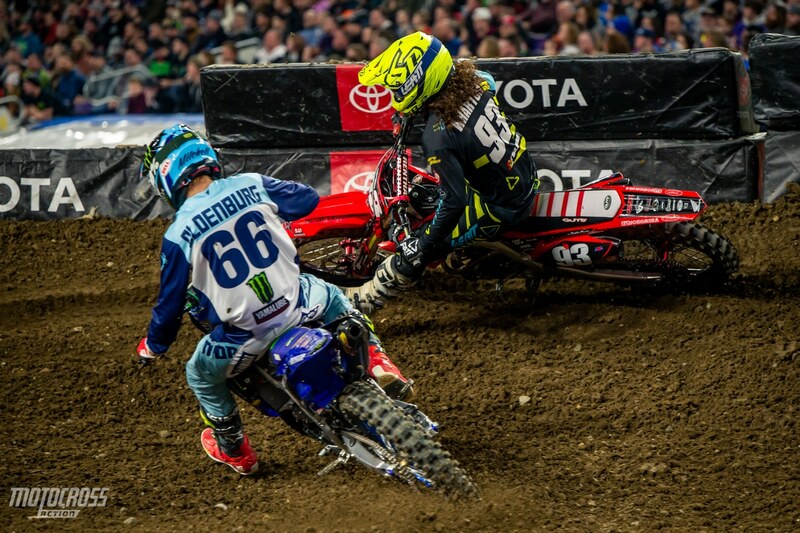 Blake Wharton #93 came out of retirement last year to race Supercross again. 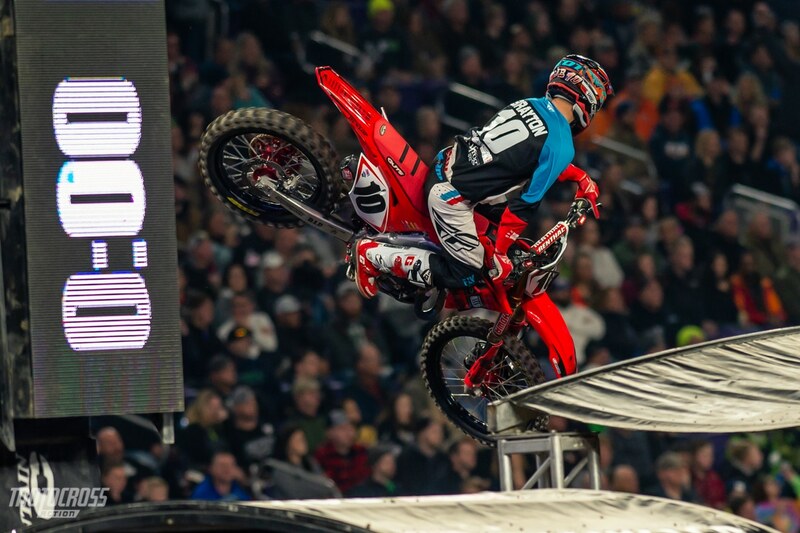 This year he’s riding for the TiLube Honda team and he had some bright moments in Minneapolis. He battled back and forth with Mitchell Oldenburg in the heat race to finish third. Unfortunately a crash in the Main event gave Blake a fifteenth place on the night. The American from Alabama, Thomas Covington spent four and a half years living in Europe, racing Pro around the world in the MXGP series. 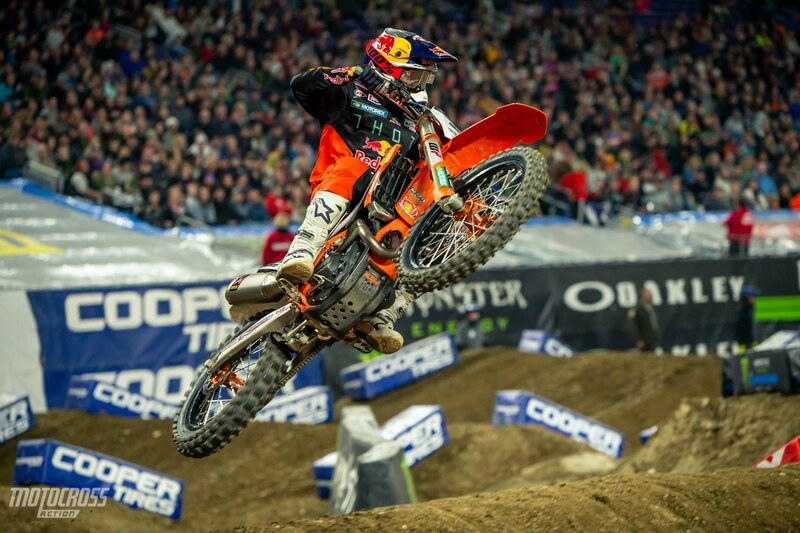 At Minneapolis he made his American Supercross debut. 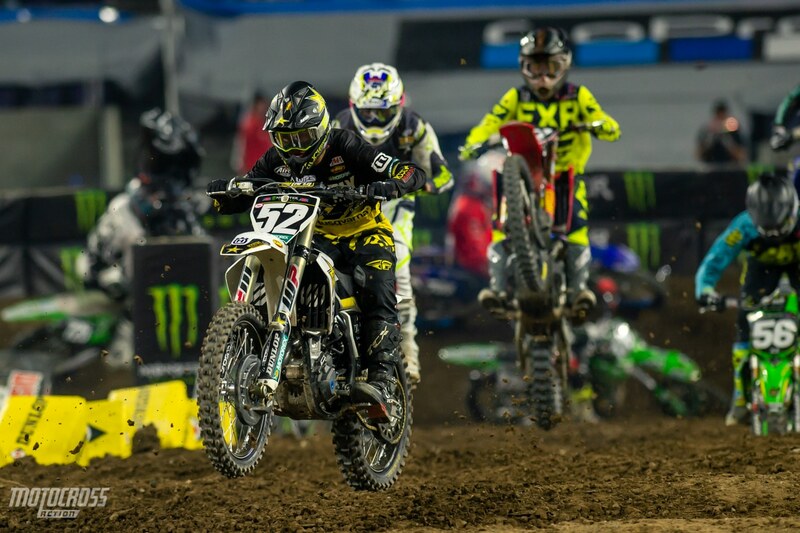 Thomas finished eleventh and we are excited to see his progress as he gets more comfortable with Supercross. Joe Perron didn’t make the Main event, but he had good style! The battles were close all day in Minneapolis. Cooper Webb grabbed the holeshot and won the first 450 heat race with Eli Tomac and Ken Roczen chasing right behind him the entire race. Cooper learned a lot in the heat and he used it to his advantage in the main event. 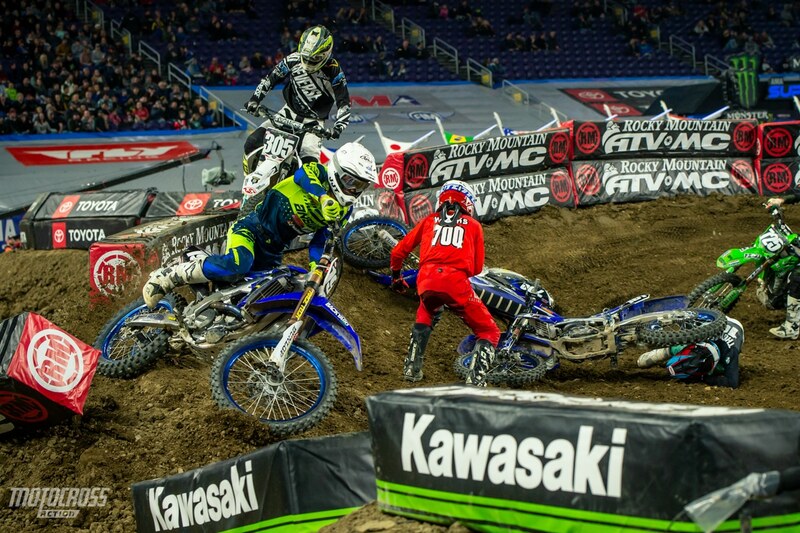 Chaos in the first 250 LCQ of the 250 East series. More carnage in the 250 LCQ! Samuel Redman slamming into Lane Shaw. 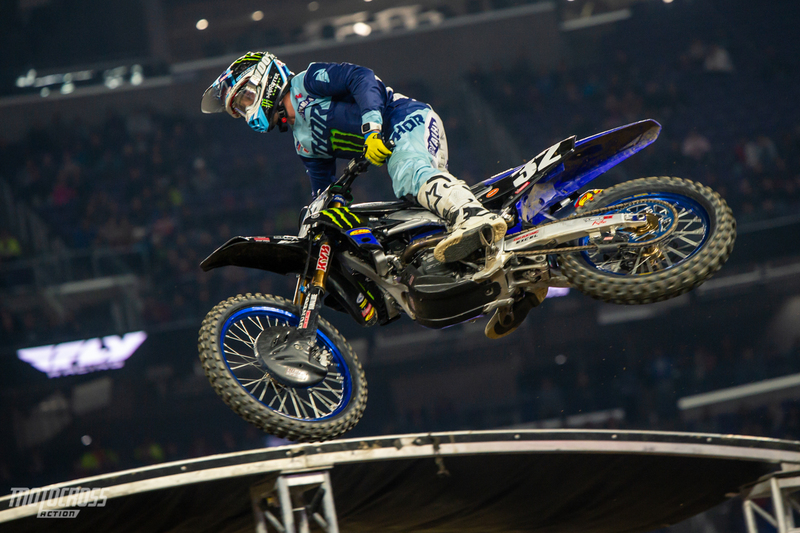 Cooper Webb looking ahead to the next rhythm section while in the air on a triple. Justin Bogle grabbed the holeshot in the second 450 heat race. Bogle led the first lap of the 450 heat, but it was Justin Brayton who made the pass on lap two and took the heat win. Cheyenne Harmon was stoked to win the 450 LCQ and qualify for his third Main event of the season. Josh Osby won the crazy 250 LCQ. 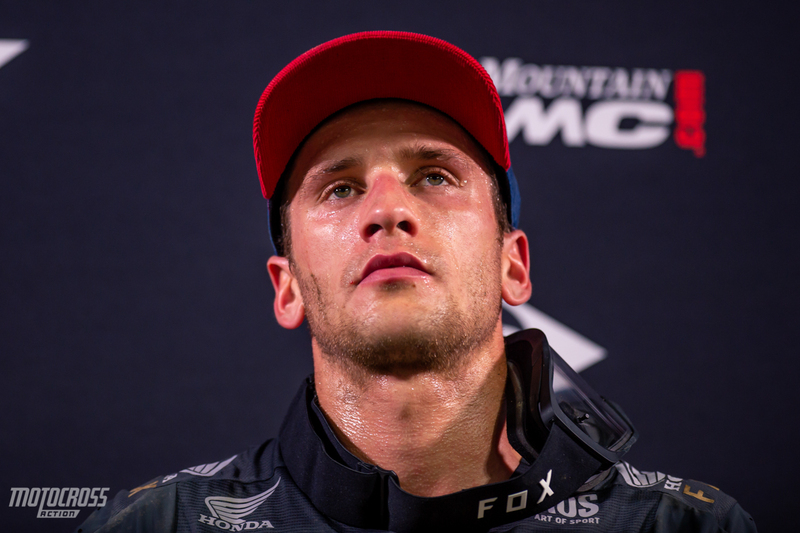 Ken Roczen still hasn’t won a Main event in 2019 but he will be running the red plate for a second time this season at round seven in Arlington. Thank you for reading MXA’s The Aftermath!